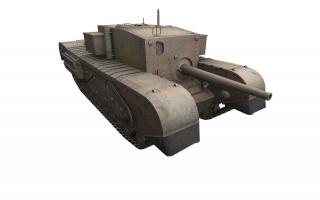 The Churchill Gun Carrier is a transitional Tank Destroyer that can only be researched through the Churchill I Tier V Heavy Tank, allowing players to move from the British heavy line to the British tank destroyer line. It has a very powerful 32-pounder anti-tank gun, one of the most powerful guns available in its tier, but is limited by its poor mobility and armor. Accurate and high-penetration guns (top gun has the best penetration of any tier 6 tank). 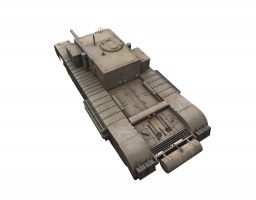 32-pdr can be used on the AT 15 and by default on the Tortoise. 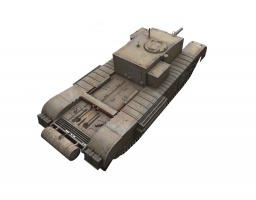 Thin and flat armor all around combined with extremely narrow gun arc prevent the driver from angling the tank. Very bad mobility, struggles even on flat surfaces. Crew members are all up front and often get knocked out. Gun depression is useless due to bad gun placement on the hull. This thing is the definition of a "glass cannon" as the Churchill GC's fixed superstructure is only 88 mm thick, totally flat and tall allowing all tier 5 tanks and even some lower penetrate it frontally. Its narrow gun arc and slow hull traverse makes it ill-adapted at dealing with moving tanks. Do not engage in close quarters as tanks like the KV-1 and KV-85 will make short work of the GC with their high alpha guns. Choose your position on the map carefully as the GC is ultimately slow and will not be able to quickly relocate. Sniping from behind foliage will have almost no effect as the GC is easily detected due to its very poor camouflage rating even if it's not moving. This vehicle also has surprisingly good gun depression, on par with most American tanks, which means it can crest over a hill, fire, and quickly retreat. Doing this will still expose most of the tank to enemy fire due to the low placement of the gun, but this allows it to peek and shoot far more quickly than attempting to round a corner. Peeking over a hill will also protect the tracks fairly well, preventing the GC from being tracked while it's exposed. 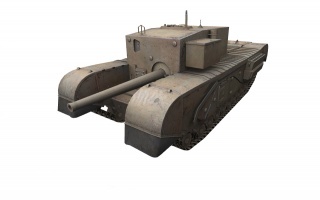 Overall, this vehicle can be frustrating to play, but if it manages to avoid enemy fire, the Churchill GC can quickly decimate almost any vehicle within its line of sight. NEVER let this tank get to the front line. Coming out of a General Staff request in 1941 to investigate fitting high velocity guns tanks. 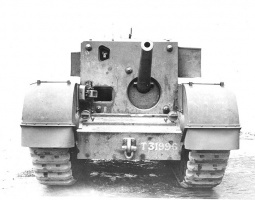 Neither the Churchill or Valentine could mount a turret with anything larger than the 6-pdr but it was proposed that a fixed superstructure could carry a larger gun with limited traverse. Vauxhall were provided with 100 guns and given the task of producing the vehicle. 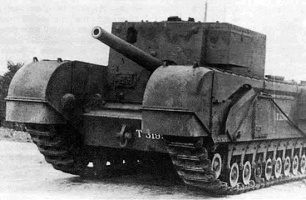 The pilot vehicles were ready for testing in early 1942 and found to be satisfactory but progress with the 17-pdr Challenger cruiser tank and refocussing on a general purpose role (and 75mm gun) for the Churchill led to a reduced order. A fixed 88 mm (3.5 in) thick superstructure with the gun in a ball mount. The gun was an otherwise obsolete QF 3-inch 20 cwt anti-aircraft gun. Fifty were built in 1942 but none are known to have been used in combat- the 17 pounder anti-tank gun gave the British the necessary firepower. Some were adapted for experimentation and training with the "Snake" mine-clearing line charge device. 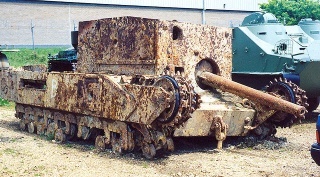 Neither the 3.7-inch nor 32-pdr gun were proposed for the Churchill Gun Carrier. Both guns were developed only for the Tortoise. This page was last modified on 17 July 2018, at 02:38. This page has been accessed 146,423 times.